Our Research Help Desk supports our members with research assistance at meetings and online at our members-only site. Members can request help at any meeting, online or by email request. The Research Committee will respond with suggestions on search options and sources. 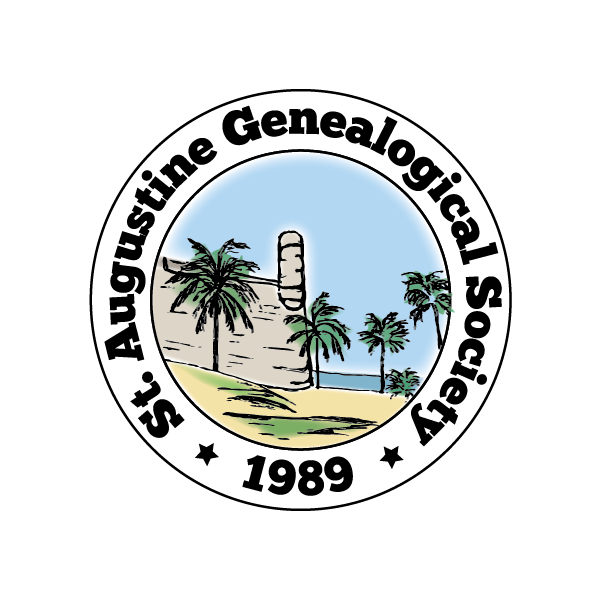 Society members maintain the St. Johns County GenWeb site – a comprehensive online index to useful research resources and local archives. This resource is open to all. The Southeast Branch Library maintains an impressive section of genealogy holdings for the county with significant support from our society. See our catalog of Genealogy Holdings at Library. You can also use the library’s online catalog to expand your search. The University of Florida’s P. K. Yonge Library of Florida History includes a number of local collections like Spanish Colonial Records, maps, Civil War collections, black history collections and World War II collections. St. Johns County section of the Florida GenWeb Archives. Passengers from the Balearic Islands to Florida in 1768 (Minorcans) are listed at Olive Tree Genealogy. Los Floridanos Society for descendants of the children born to the Spanish settlers who came to Florida during the first Spanish period (1565-1763). The Florida State Genealogical Society’s Florida Pioneer Descendants Certification Program honors descendants of Florida pioneers who settled in the Territory of Florida prior to Florida achieving statehood on 3 March 1845. Ecclesiastical Records of the St. Augustine Diocese include baptism, marriage and burial records from the 16th century into the 19th century. It is hosted at Vanderbilt University. The Flagler Museum in Palm Beach has a history of the Florida East Coast Railway on their website. The Doctor Bronson’s History of St. Augustine website offers an impressive history of our area. Historic photographs of St. Augustine, Hastings, Anastasia Island, Ponte Vedra, and Matanzas Inlet can be found at Florida Memory. WPA Stories and other local histories at Florida Memory and other sources. Index to the East Florida Papers – a collection of documents (still only available on microfilm) – which contains the complete local government archive of Spanish East Florida (1784 to 1821). There is an amazing amount of online research support – most of it accessible at no charge. Society members also maintain the Genealogy 101 blog which serves as a clearinghouse pointing to articles, videos and other information to help you make the most of your research efforts.